desire is for us to be a mere “clay pot.” A “clay pot” is shaped by the Potter Himself and is created to endure the daily abuse of fierce disappointments, bitter tears, and the heat of a fiery trial. It may not be nearly as attractive as a beautiful “teapot,” however, an “earthen vessel” (or clay pot) is much more valuable to God. Rather than drawing attention to itself, its very worth is determined by what it is filled with. Countless treasures are hidden in the midst of the “dirt” and “grime” that God allows into our lives. However, our proud and sinful nature is naturally drawn to a life of ease and, in our society, we are taught to take care of the BIG “I.” “I deserve to be happy….If I don’t take care of myself, who will?” This mindset has been a huge downfall in the world, as well as in the church. I have looked at my life to many times from a china “teapot” perspective. I have thought that I should be handled delicately and have forgotten that I was never created to be a “teapot,” but rather a “clay pot” with God determining my worth. The solution to this problem is rather simple but extremely difficult for our flesh to do. We need to remember that our “earthen vessels” are functional — they exist only to serve one purpose. This purpose is to merely hold what the Creator has designed for us to hold. Just like the clay pot, our individual value is not the treasure. The treasures that we posses determine our value. In the same way that the clay pot contains “gold nuggets” mixed in the dirt, when I have dug deeply, I have been able to find rich treasures buried within the “dirt” of my life. Some of these treasures have been true joy, abundant grace, indescribable peace, and sincere compassion for others experiencing pain or loss. Knowing about these treasures, if I would have a choice of which container I would choose for my life, I would have chosen my ugly “clay pot” because this is what my Potter has lovingly designed for me. While I still wince to say this, in my spirit I know that this is the best path for me. 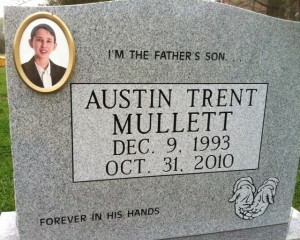 Last week, I went to see the newly placed tombstone of our beloved and greatly missed son, Austin. Although Austin went to be with Jesus two and a half years ago, we had never felt ready to face the reality of getting the marker for his grave. It felt as if it was the last thing that we would ever be able to do for our dear son. I have never found much comfort or healing in visiting Austin’s grave, however, on this particular afternoon, I felt the need to stop there. As I knelt and looked at his picture on the tombstone, the pent up tears and emotions flowed from deep within. After some time of crying and praying, I felt refreshed in my spirit and renewed to continue my journey that daily leads me a bit closer to eternity. Although I greatly long to be with Jesus and Austin in heaven, I realize that God still has a specific purpose for my life here on earth. I was renewed to continue to trust my Father with the events that He allows to come my way, even though they aren’t always what I would choose. I am so grateful for the countless “nuggets of gold” our family has found in the trials, pain, and loss that we have experienced over the years. Have you been dissatisfied with the “earthen vessel” that you have been given? Instead of complaining and whining about your “lot in life,” maybe it is time to start digging for the “gold” that has lovingly been placed by the Potter within the “dirt” and “grime” of your life. Is it time for you to open your hands in surrender and commit your “vessel” to the Potter who knows what is best for you? At the end of your life, you may find yourself nauseated by the sour taste that your “teapot” is filled with, or you may find great joy in the nuggets of “gold” that you have found along the way. Are you still struggling and attempting to be a fine, “teapot” or have you found contentment in being a battered “clay pot” with a specific calling and eternal purpose, uniquely designed by the loving hands of your Potter? Thankyou for posting these beautiful encouraging thoughts!! I am beginning the search for gold in my wonderful earthy clay!! 🙂 blessings and peace to you! Thank you so much for writing this, Cindy. It’s exactly what I needed to hear today. May God bless you for sharing your heart… your “battered clay pot” is beautiful, inside and out. Thank you Cindy for this beautiful analogy. My heart goes out to you in this difficult separation from your son. Life truly can be hard, but it’s so good to know that as we allow the Potter to shape and mold us, we’ll find the nuggets of gold He gives. Yet the best is still to come! Hallelujah! Yes, Jackie, the best is truly yet to come! God continues to show me that my focus needs to be on heaven instead of on this life. Thanks for blessing me with your encouragement. Blessings as you serve Him!